Thames Valley Archaeological Services Monographs Volumes 17 and 18 published - Both volumes, detailing excavations at St John's College, Oxford and Thetford, Norfolk respectively, are now available for purchase. 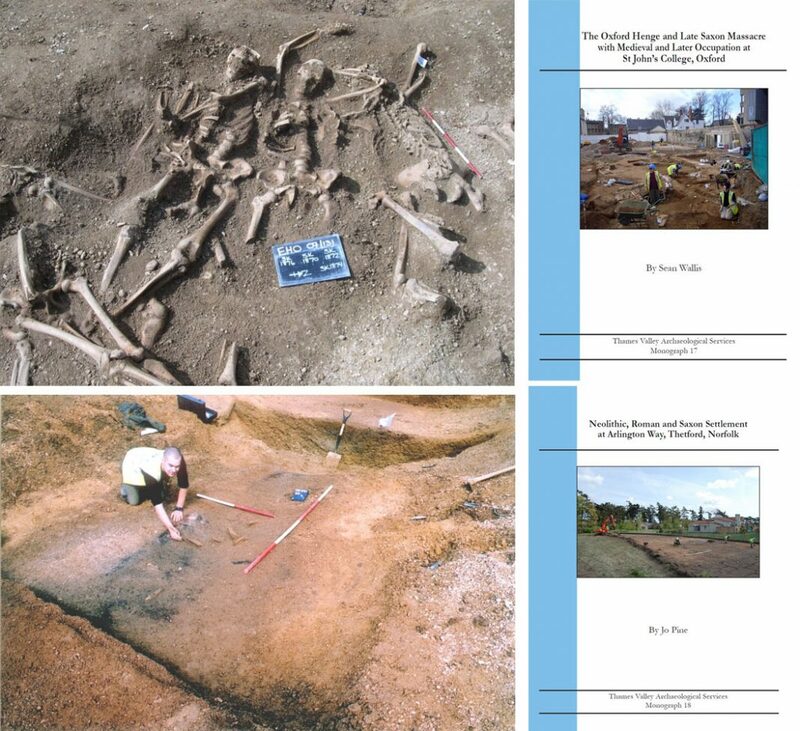 Monograph 17, entitled “The Oxford Henge and Late Saxon Massacre; with Medieval and Later Occupation at St John’s College, Oxford“, presents the results of archaeological excavations undertaken in at the College in 2008. These investigations in the heart of Oxford have dramatically altered our view of the prehistoric landscape, provided striking evidence of a massacre dating to around AD 1000, and shed light on the later occupation of the site: a suburb in the medieval period and later a farm. The original news items detailing the discovery of the Saxon burials and the henge beneath the bodies. Monograph 18, “Neolithic, Roman and Saxon Settlement at Arlington Way, Thetford, Norfolk”, focuses on archaeological excavations which were undertaken in advance of housing development on the south-eastern edge of the town. Here archaeologists found a complex landscape, used and occupied over a considerable time during the Roman and Saxon periods. The findings provide an extension of the wider topography of the Roman and Saxon settlement, previously revealed to the south at Melford Meadows where they occupied a terrace ridge above the flood plain of the river Thet. For more information and to order a copy of any of the volumes in the TVAS Monograph Series please visit the Monograph Series information page and complete the order form.